Whether you have space restrictions, the need for another back up power, a unit to control hydraulics for the entire plant, a harsh environment, or a food safe washdown environment, we can find the solution to fit your requirements. We have built many types of power units with a wide range of options over the years. Click through to see some solutions from the K.R. West design team. K.R. 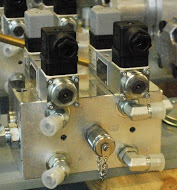 West Company has the ability to build simple to sophisticated pneumatic and electric custom control units. We can work with your company for complete machine integration. We can do in-house work, as well as contracting for controls. See some examples of our in-house custom built controls. We can customize a filter cart or design a lubrication unit to provide a solution for your system to contain clean, temperature regulated hydraulic oil. Filtered and cooler oil will extend the life of your hydraulic components. Along with our power units, controls, and filtration units; we have the ability to modify and assembly custom components. Example of our previous custom work include, but are not limited to, valve manifolds, accumulator frames, cylinder modifications, air prep component modifications and valve plate solutions.